How many clubs have junior sized stumps but can't find a set of junior sized bails? Here is the solution. 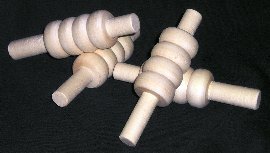 A set of four unvarnished bails in a youth/junior size.